With his ghost girlfriend Sheyenne, his bleeding-heart lawyer partner Robin, and his Best Human Friend Officer Toby McGoohan, Dan Shamble is back from the dead and back on the case. The feathers will fly as he goes face-to-beak with the evil peckers. Includes bonus story "Road Kill." The book was decent, reader doesn't know how to pronounce hemoglobin, which in a book about vampires, comes up a LOT. There were other mispronounced words as well, though none that I can remember after the frustration of hearing hemoglobin over and over and over. Multiple times wasn't sure what he was saying because his pronunciation was so unusual. LITERALLY didn't realize he was even saying hemoglobin until 75% of the way through the book until it dawned on me. Reader has a near monotone for a majority of the book as well, just reading the lines somewhat flat, not giving many lines and deliveries differentiation that would have been easy, with even just an additional pause between statement A and Statement B. This was another fun Dan Shamble story. Unfortunately, the narration was really "off". It sounded like it was done by an AI program and not a real narrator. There were many mispronunciations of common words and the other parts of the narration were flat... no emotion, no inflections. Nothing. Listening closely, the words seem clipped and cut off, re-emphasizing the thought that this was done by computer and not a live person. 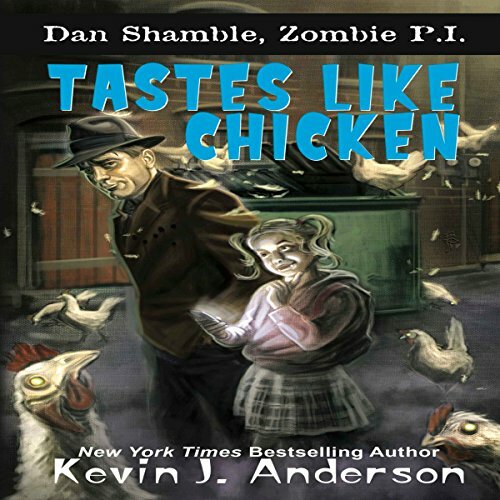 I love Dan Shamble, but the narrator seemed to be rushing through the book. In addition, he mispronounced several words, which is distracting. But the story is great. Although I didn't love the narration, the story was brilliant. Loved the macabre humor found throughout. I still like the stories, and Don Abad isn't terrible, but he doesn't tell the story with nearly the same level of skill as Phil Gigante. The end result just is not as enjoyable.